This article originally appeared on Cyclismas. Cycling has many holy grails. The Tourmalet, Alpes d'Huez, Ventoux, Stelvio, Gavia, Koppenberg, Arenberg to mention a few. I know this probably could be viewed upon as a bit early, but there is something going to happen i Belgium soon that is worth mentioning; the Kermesse season. Lasting twice as long as normal crits, add bad road conditions and you have the recipe for fun, for form build-ups and potential pro contracts as well as carnage. This may be just fun to us, but it is also a possibility to shine for local riders, to be recognised. The Kermesse-season begins in February but if you think that's too early don't be sad, the season lasts until October. Kermesse is more or less a local race, but is important to differ between the pro Kermesse and the amateur Kermesse. By "pro" they mean continental and higher, but don't jump to conclusions too fast, the pace in there amateur races are incredible fast and you do need an active licence to race. If you don't have a licence by your governing national cycling body or with the UCI, you can get a Belgian one. The licence costs about 12 euros and is basically a Belgian race licence, which you can use for several years. Normally, there is a race fee too, somewhere between 8-10 euros. One funny anecdote is that you pick up your race number at a local café, along beer drinking and smoking Belgians. When (if) finishing the race, you deliver the race number back at the same café getting 5-6 euros back. How is that for some fun? Almost free. The name Kermesse also mean "festival" and sometimes there is a festvial to celebrate cycling where the actual race takes place. As mentioned, the Kermesse is almost twice as long as regular crits, between 90-140 km. The circuit they race is somewhere between 5-12 km, often about 100 riders on the start line. Some kermesse races see up towards 200 riders participating. In February the Kermesse races take place on Saturdays and Sundays, but later in the season, you can pretty much ride every day of the week. 4-5 races in the weekend only makes it difficult to choose the right one. People gather in the streets, surrounding team cars and line the fences cheering for their favourite. Still surprised the Belgians are crazy when it comes to cycling? Most of the races begin at 1400, but registrations are open two hours before that and closes 15 minutes prior to the race. That info can be found at Wielerbond Vlaanderen. The road conditions are known to vary so if you bring your Zipp 404, be prepared to walk out there without one. Could also be an idea to bring pins yourself as there will be lack of pins as the riders pick up their race number. If you DNF for some reason, do not go home before the race is officially off. It could be your number is picked for a contrôle anti-dopage and no-show on that is the same as testing positive. Now you are thinking that the riders participating in these races are local heroes and crazy Belgians only, but that is not true. many pros use these races to build form towards important races. Last year, both Edvald Boasson Hagen and Kurt Asle Arvesen of Team Sky used several Kermesse races to build speed in front of the Worlds. As did many others so this is quality racing, let there be no doubt about that. To some, a crazy Belgian crit isn’t a holy grail, but to me, the kermesse carry the essence of cycling. 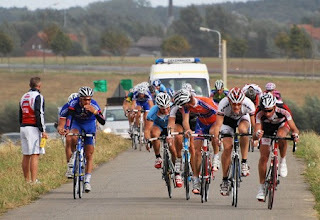 Kermesse races are fast and dynamic, and can be described as an experience rather than just a race. Expect continuous attacks, cobbles and locals all mixed into a flurry. Three teams are flourishing so far - why?